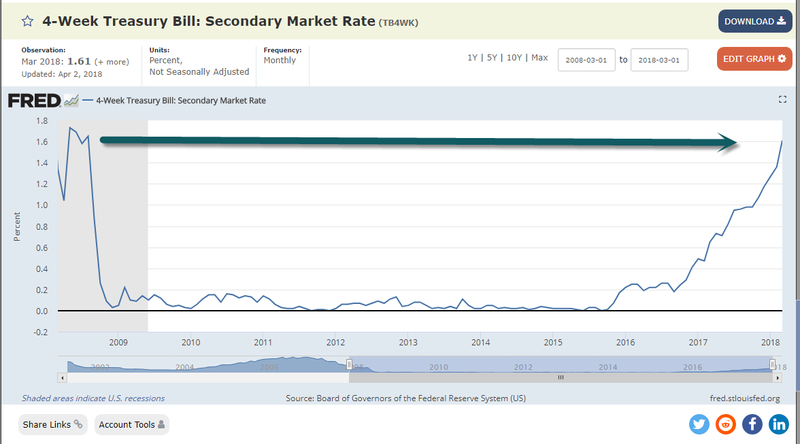 1.4-Week Treasury Bill 10 Year Chart…Sideways for 8 Years then Hockey Stick. 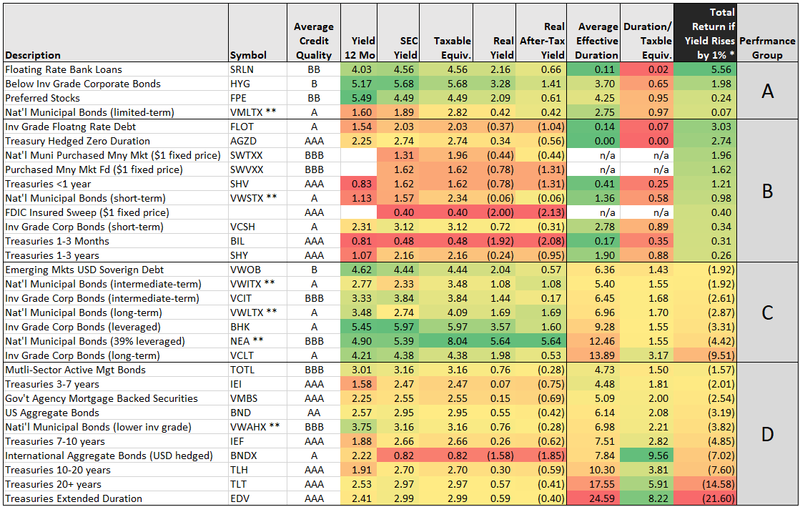 2.Grid-Rates Rise 1%…What will your bonds do? 3.Small Caps and Industrials Making the Most New Highs Since April 1st. While the S&P 500 Index SPX and the S&P Equal Dollar Weighted Index SPXEWI are still sitting roughly 6% off of their all-time highs from late January, we have witnessed some areas of the market move higher over the past few weeks. Since the beginning of the month, the SPX has gained 4.31% while the S&P 400 Midcap Index MID has gained 4.27% (through 4/19). However, Small Caps have been the clear winner as the S&P 600 Small Cap Index SML has gained 5.51% over the same time frame. 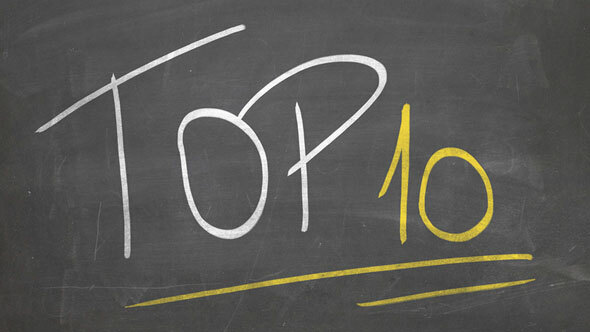 In fact, since April 1st, we have seen 96 stocks within the S&P 1500 move to new all-time highs. When we take a closer look at these new highs, we can see that some areas of the market are participating more in this rally than others. Small Caps have led the way, not only by performance, but also by headcount, accounting for 40 of the 96 stocks (41.66%) moving to new highs. 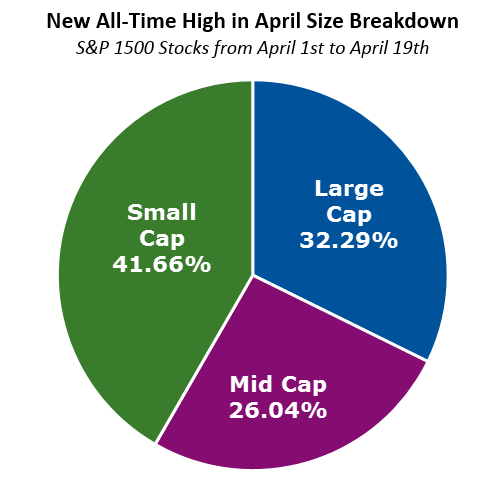 Large Caps are next in line with 31 stocks (32.29%), followed by Mid Caps with 25 stocks (26.04%). As we lift the hood and take a closer look at the individual names, we are able to pinpoint sector participation. 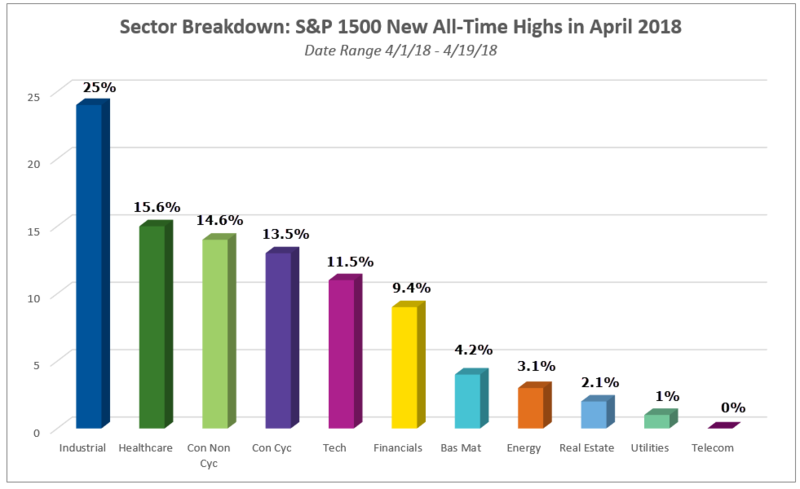 The image below shows the number of stocks within each sector that have hit a new high between April 1st and April 19th (with the percentage of the 96 new highs the sector accounts for shown above each of the bars). 4.Earnings Better ….Revenues Not So Much. In last Friday’s Bespoke Report newsletter, we provided our first rundown of this season’s earnings results. While only 10-15% of companies have reported so far, it’s still enough to give us an early read on how companies performed in Q1. Below are two charts we thought we’d share more broadly with Think B.I.G. readers. In the first chart, we show the percentage of companies that have beaten consensus analyst EPS estimates on a quarterly basis going back to 1999. So far this season, 80% of companies that have reported have beaten EPS estimates. If that reading were to stand — and note that we don’t expect it to stand — it would be the strongest earnings beat rate seen in at least 19 years. Needless to say, companies have been beating EPS estimates at a historic clip so far this season. In the second chart below, we show the percentage of companies that have exceeded consensus top-line revenue estimates on a quarterly basis. 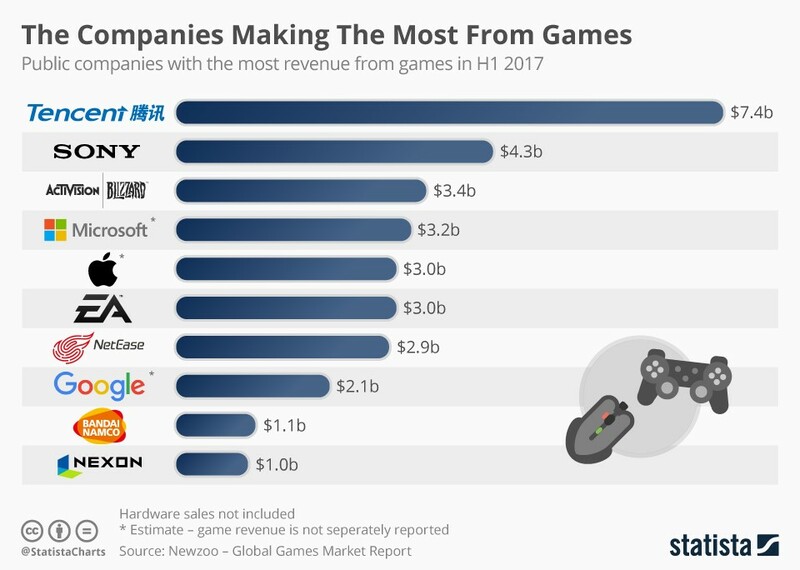 In terms of revenues, the beat rate looks much different this season compared to earnings. 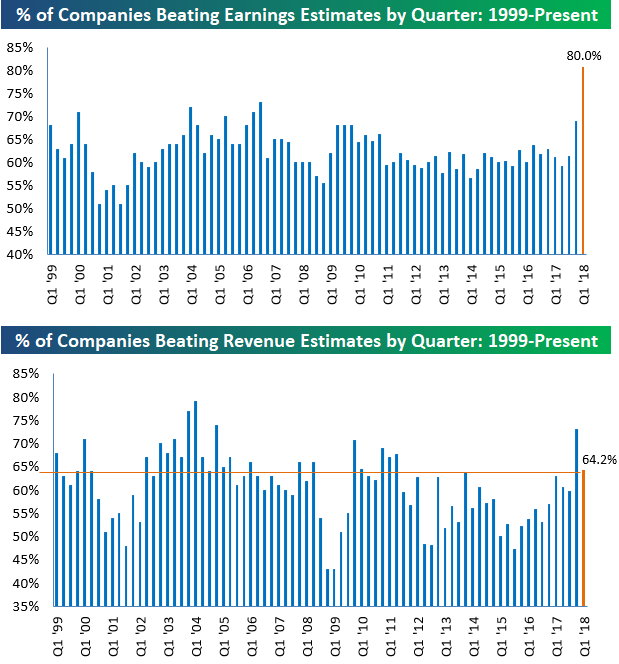 Only 64.2% of companies have beaten revenue estimates, which is nearly 16 percentage points below the EPS beat rate. If we had to choose, we’d prefer the top-line beat rate to be stronger than the bottom-line beat rate, because sales are harder for companies to manipulate. Last earnings season we actually saw a stronger revenue beat rate than earnings beat rate, but the opposite has been the case so far this season. 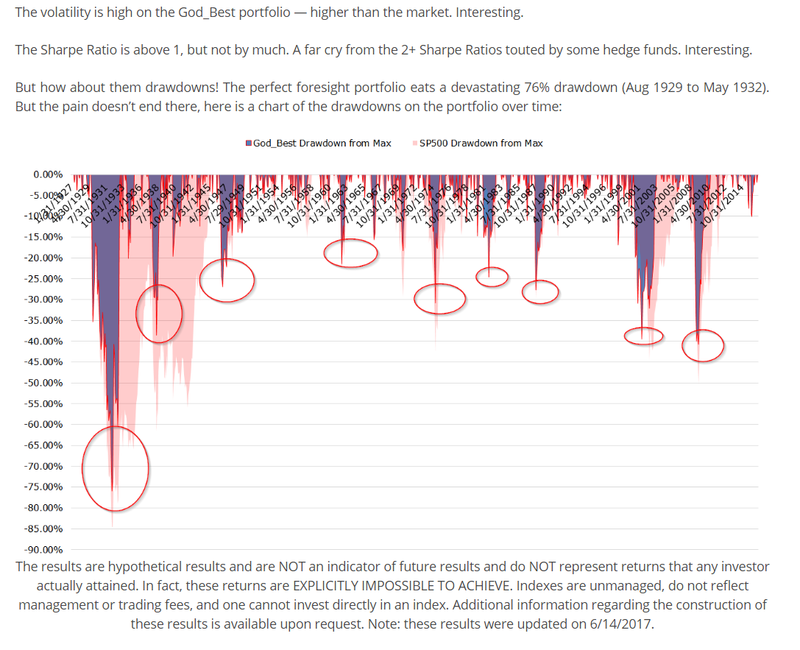 5.Great Read from Wes Gray…Even If God Were Picking Stocks, It Would Be Tough to Ride Out Drawdowns. 6.High Yield—Highest Short Interest in 5 Years and Heavy Outflows. 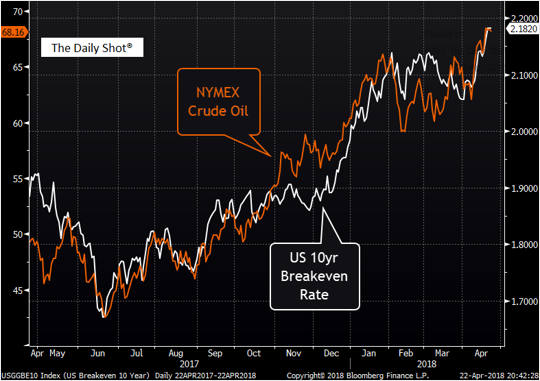 7.Rates: Oil prices have been driving inflation expectations higher. 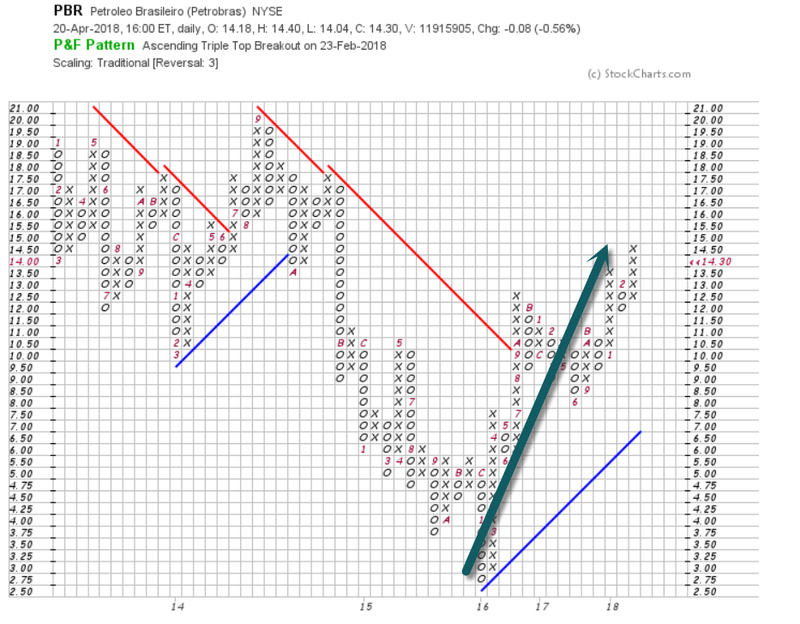 Oil Beneficiary…Petrobras Rumored for Dead in 2016-PBR +480% Return Since 2016 Lows. 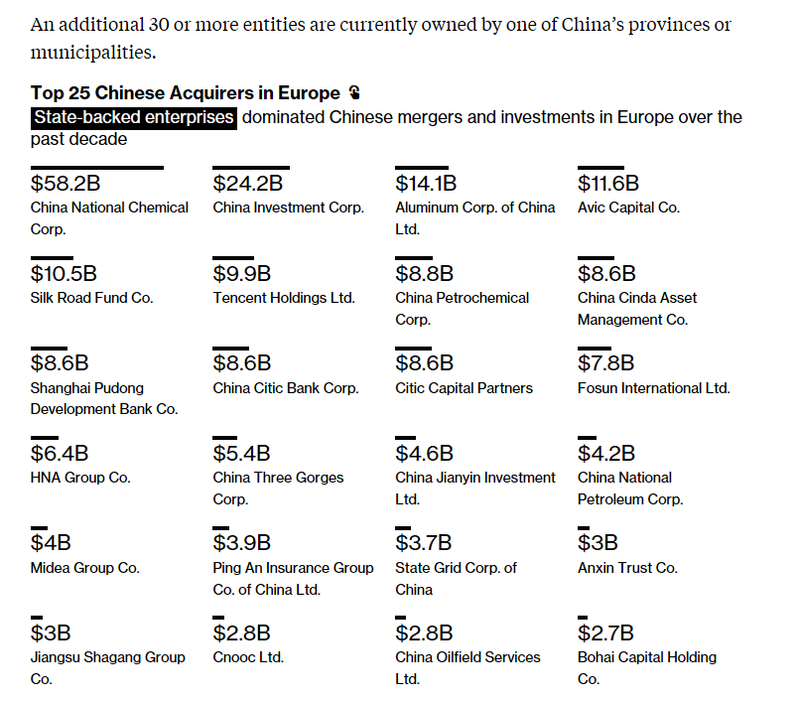 8.Last Week We Mentioned China Rivaling the U.S. in Venture Capital….See Below as China Buys Up Europe. For more than a decade, Chinese political and corporate leaders have been scouring the globe with seemingly bottomless wallets in hand. From Asia to Africa, the U.S. and Latin America, the results are hard to ignore as China has asserted itself as an emerging world power. Less well known is China’s diffuse but expanding footprint in Europe. 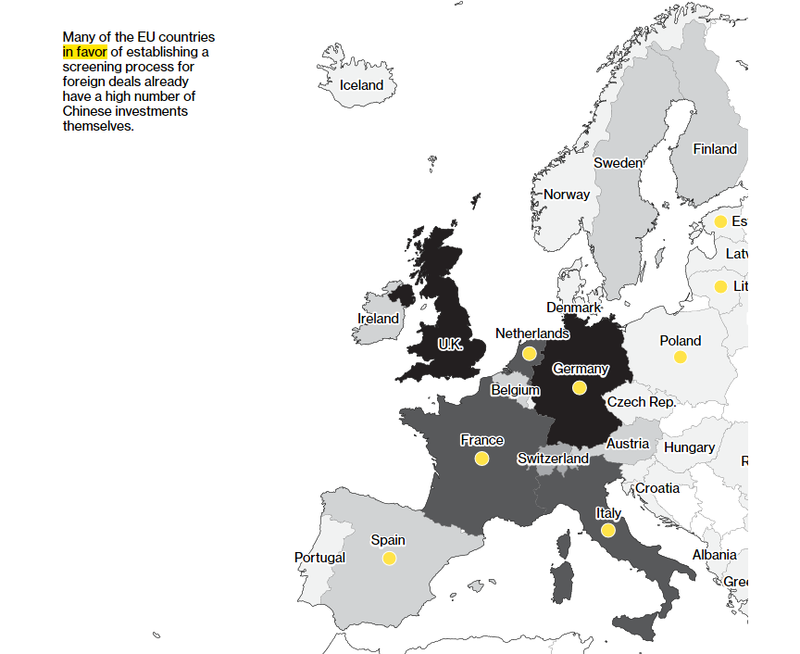 Bloomberg has crunched the numbers to compile the most comprehensive audit to date of China’s presence in Europe. It shows that China has bought or invested in assets amounting to at least $318 billion over the past 10 years. The ontinent saw roughly 45 percent more China-related activity than the U.S. during this period, in dollar terms, according to available data. The volume and nature of some of these investments, from critical infrastructure in eastern and southern Europe to high-tech companies in the west, have raised a red flag at the European Union level. Leaders that include German Chancellor Angela Merkel and French President Emmanuel Macron are pressing for a common strategy to handle China’s relentless advance into Europe, with some opposition from the EU’s periphery. 9.Chinese Tencent Preparing Biggest IPO of the Year. China’s largest music streaming company, Tencent Music Entertainment Group, is preparing an IPO that could be one of the biggest ever recorded for a tech company, reports the Wall Street Journal. Why it matters: The group’s listing shows that public offerings are continuing to build steam in the tech world and it could be one of the largest deals of 2018, potentially raising as much as $25 billion. Every successful investor has an edge. And when I say ‘edge’, I’m referring to the difference we have that gives us an advantage in a situation. In investing, this could be a structural edge such as access to better information or low-cost permanent capital, or it may be an intellectual edge derived from creativity or lateral thinking or a psychological edge like emotional rigor or temperament. It could also mean having a longer time horizon than other investors, or even a better reputation. Outperformance as we know it is usually derived from a combination of more than one edge. I’ve long thought about the edges Warren Buffett has. These are his differences that he has utilized to allow him to deliver returns far in excess of the market indices; you don’t compound capital at nearly 20%pa for over 50 years without some sort of serious edge. [Buffett’s skill in writing has helped him develop a rapport with Berkshire’s shareholders. He’s under no pressure to buy or sell assets or keep up with an index. He doesn’t have to worry investors will pull their money. Unlike most managers, it has allowed him to maintain a long term focus]. While the list of Buffett’s edges is long and I’m sure you can think of others, he does have some headwinds. One of those is size. Another is the fact he doesn’t close under-performing businesses – that’s the likely cost of seeing more private opportunities. He’s also conservative. Carrying more debt would have generated even more returns, but it could also have led to the permanent loss of capital. And that would have broken Buffett’s first rule: Don’t lose money. Many of Buffett’s edges are available to all investors. He certainly doesn’t hide them; he’s been writing about them for the last 50 years. But there’s one other edge I haven’t mentioned, and it could be the most important of all – Charlie Munger. And what an edge that is. Buffet has given us much in the way of learning over those 50 years, and Charlie has as much and more to teach. And if you’re looking for more, you could certainly start with him.